The Shrine of Our Lady of St. Saviour (Santuari de la Mare de Déu de Sant Salvador / Santuario de la Madre de Dios de San Salvador) is a sanctuary of the island of Majorca located southeast of the town of Felanitx. 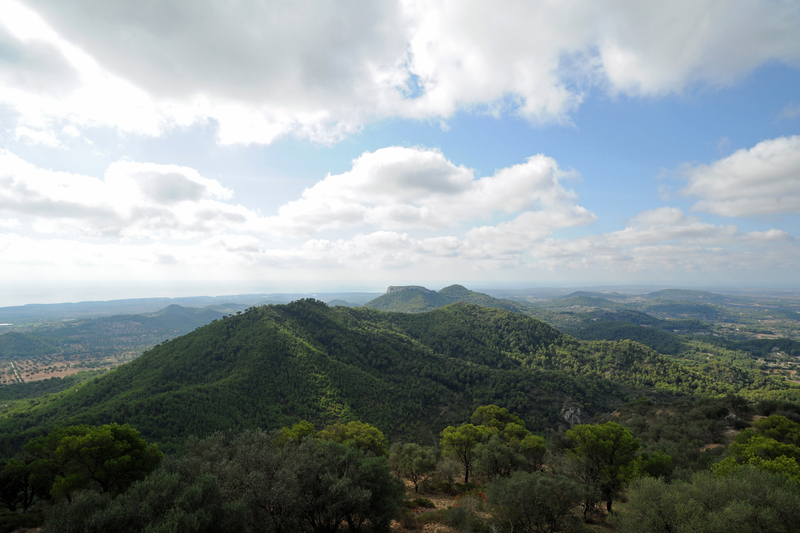 Do not confuse the Sanctuary of Sant Salvador de Felanitx with the sanctuary of Sant Salvador Artà, which is about fifty kilometers north-east, on another Mount appointed him as Puig de Sant Salvador. 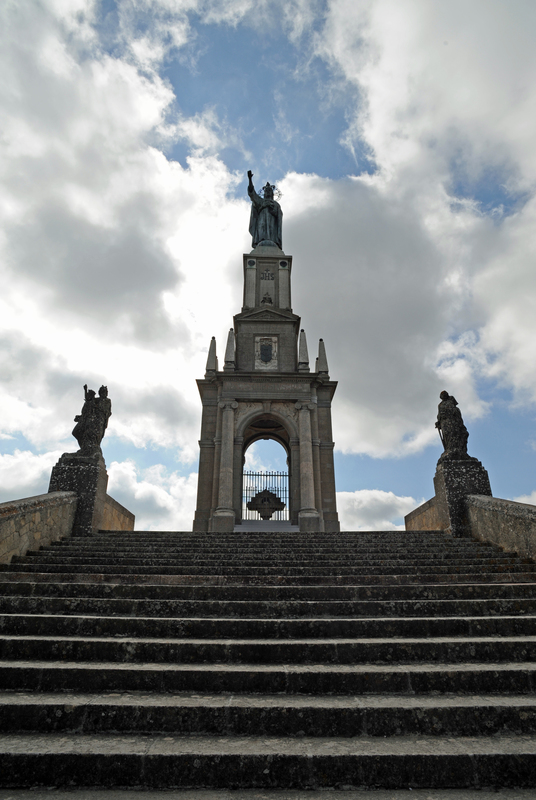 The Sanctuary of Sant Salvador, founded in the fourteenth century, is one of the greatest pilgrimage sites of the island. 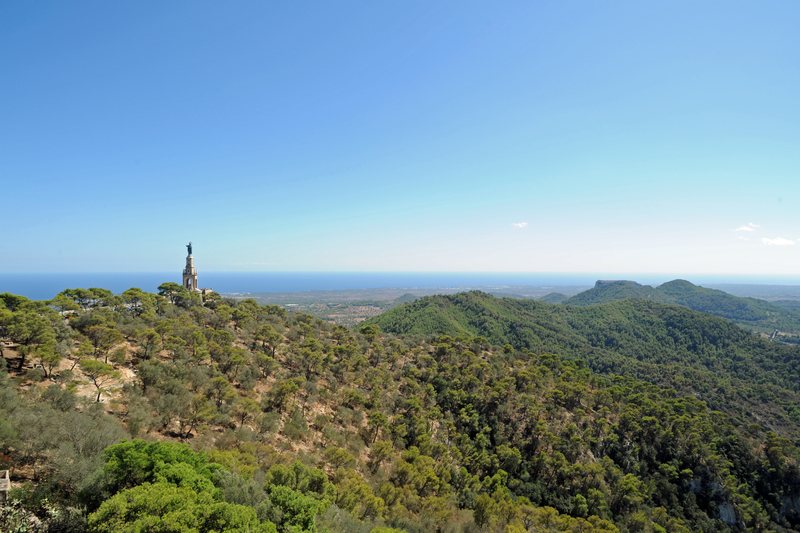 The Sanctuary of Sant Salvador is located at the top of Puig de Sant Salvador in the south-east of Mallorca. The Mount of Sant Salvador (510 m) is the highest point in the southern part of the chain of the Levant (Serra de Llevant). 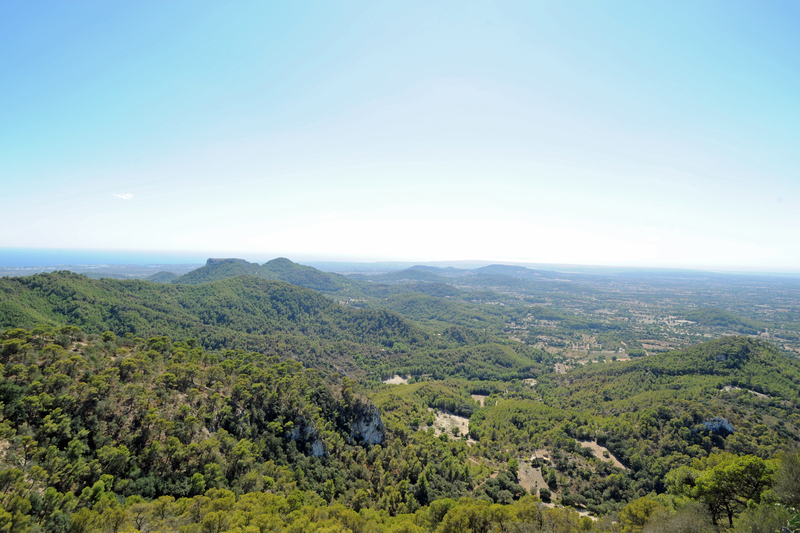 The sanctuary is distant 6.5 km from the town of Felanitx, away from the road Ma-4010, which connects the port of Felanitx Portocolom on the east coast of Majorca. 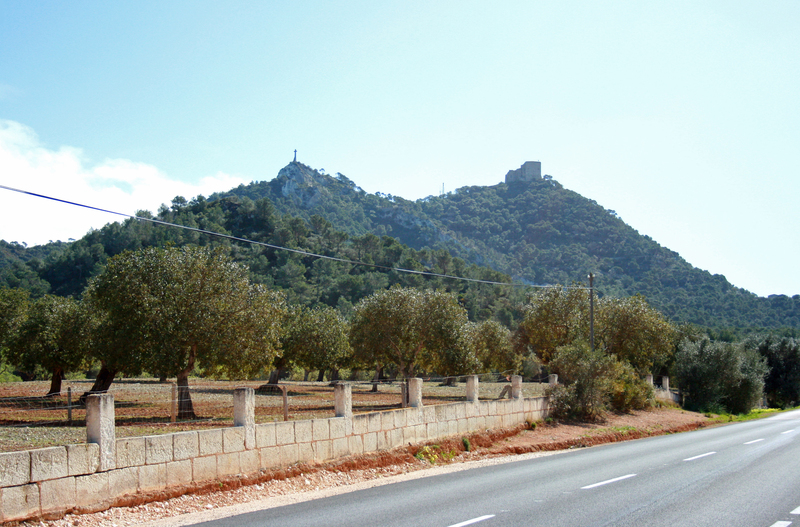 A small road 5 km is on the right, and tight switchbacks up to the sanctuary and the road offers many points of view, past a small chapel in front of a large stone cross, the Creu del Picot, then before the monument to Christ the King. This road in good condition, was built in 1923-1927 and is used by many cyclists as a training course. 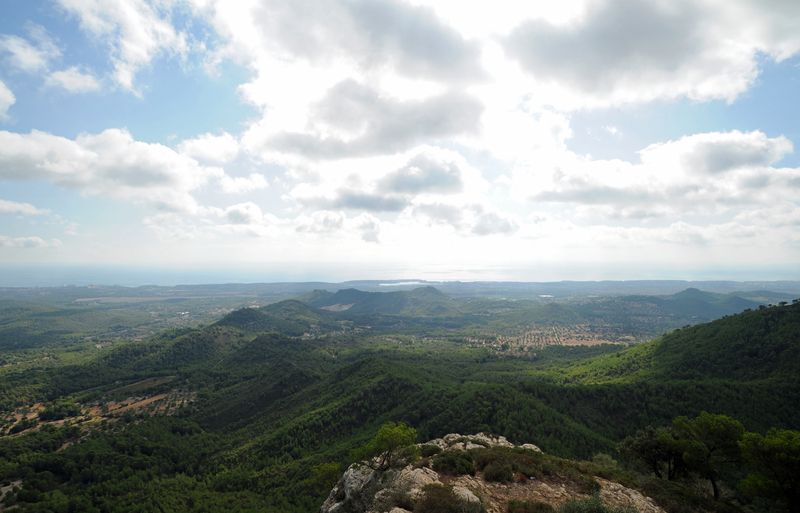 The rise can also be done on foot from the road that goes to Portocolom : 1,5 km after the exit of Felanitx, a marked path leads to the Sanctuary of Sant Salvador. 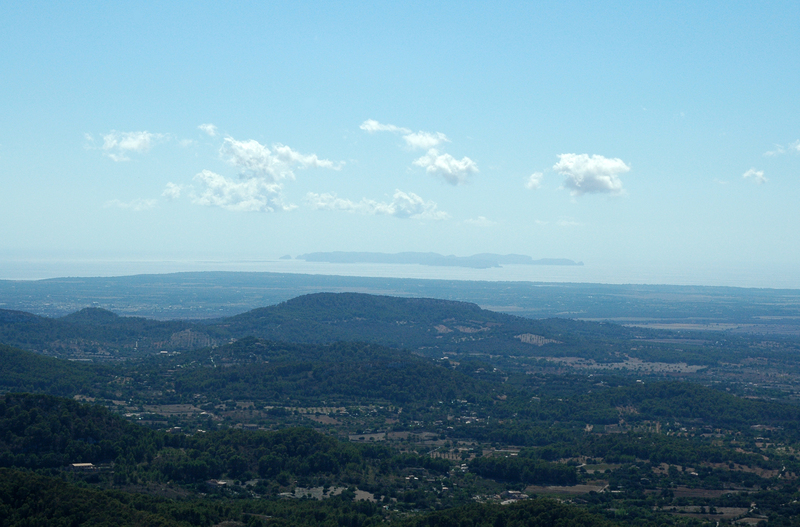 to the northwest you can see the Serra de Tramuntana. 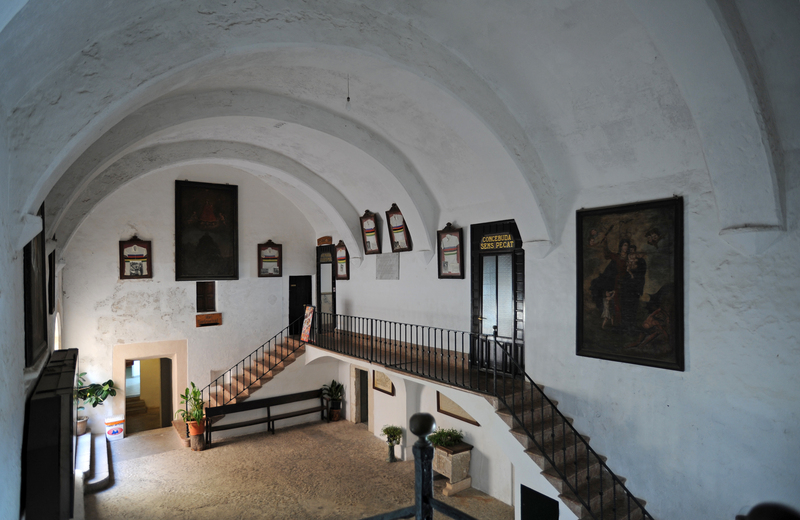 The Sanctuary of Sant Salvador was founded in the fourteenth century, in 1342. In 1348 the first chapel was completed, two other churches succeeded him, the last of which dates from the early eighteenth century. 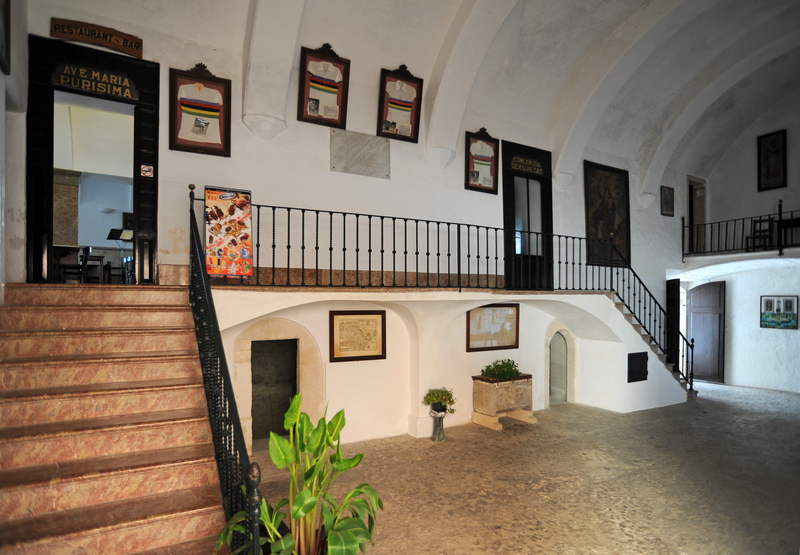 The sanctuary is a package that includes, in addition to the church, a monastery, a hostelry once reserved for pilgrims, but now welcomes travelers. In addition to being a place of pilgrimage, the shrine had different secondary uses over the centuries: in the sixteenth century, there was a "grammar school", in the seventeenth century, the building served as a watchtower to guard against attacks by Barbary pirates. 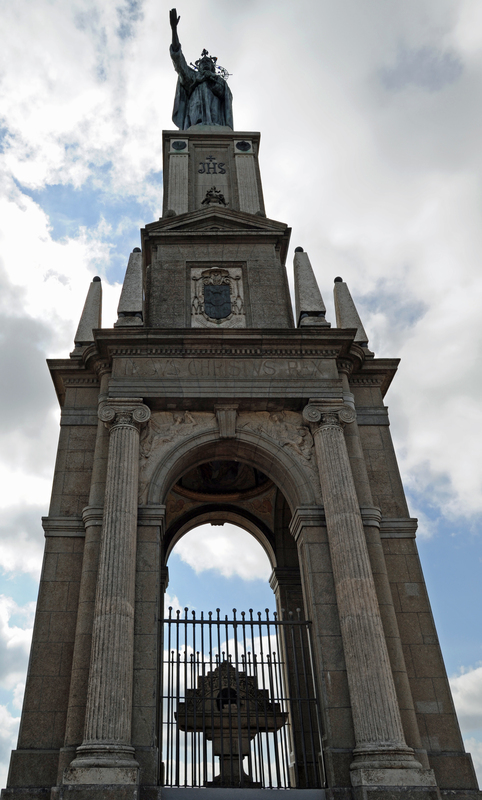 The church and the buildings for pilgrims were rebuilt in the course of the eighteenth century. In 1824, the sanctuary was created a community of hermits who lived there until 1851. In 1885, the town of Felanitx, who was owner of the sanctuary, ancillary buildings and land (finca) of Puig de Sant Salvador, sold them at auction. The new owner was Don Juan Antonio Puig y Montserrat (1813-1894), a native of Felanitx, who was bishop of Puerto Rico. Antonio Puig donated all the diocese of Majorca, which gave sanctuary to a Majorcan congregation hermit monks in 1891. The Congregation of Hermits of St. Paul and St. Anthony (Congregació d’Ermitans de Sant Pau i Sant Antoni / Congregación de Ermitanos de San Pablo y San Antonio) took charge of the sanctuary until 1992, when the last monk disappeared. 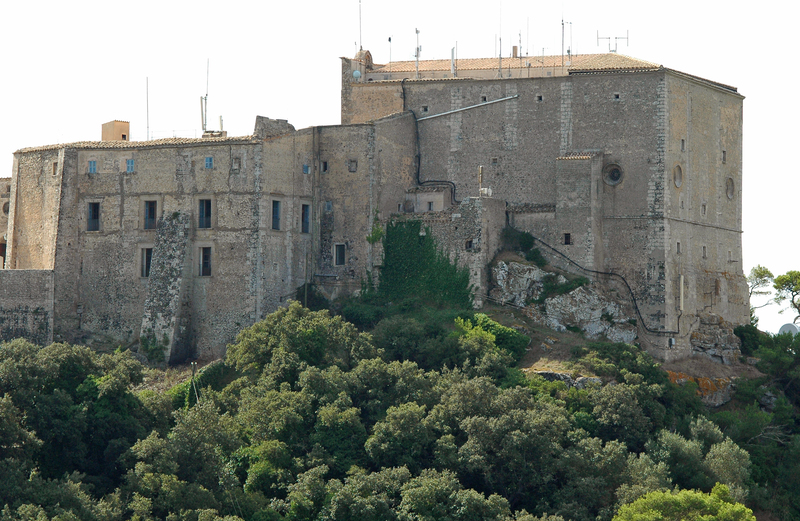 The mountain and the sanctuary are still owned by the Diocese of Majorca, but are run by lay brothers and sisters of Felanitx. 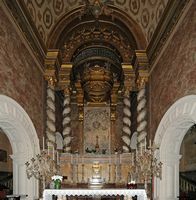 Although the sanctuary has the appearance of a fortress, it retains two remarkable cultural treasures: a Gothic altarpiece of the Passion of the effigy of the Saviour and an effigy of the Virgin. 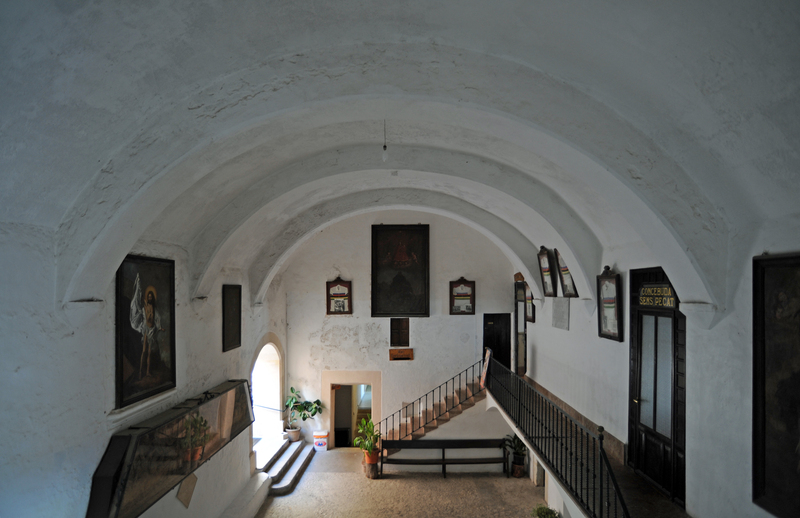 The sanctuary is always a popular place of pilgrimage, in a room on the courtyard in front of the church, you can see many ex-voto and poignant prayers to Our Lady of Sant Salvador. 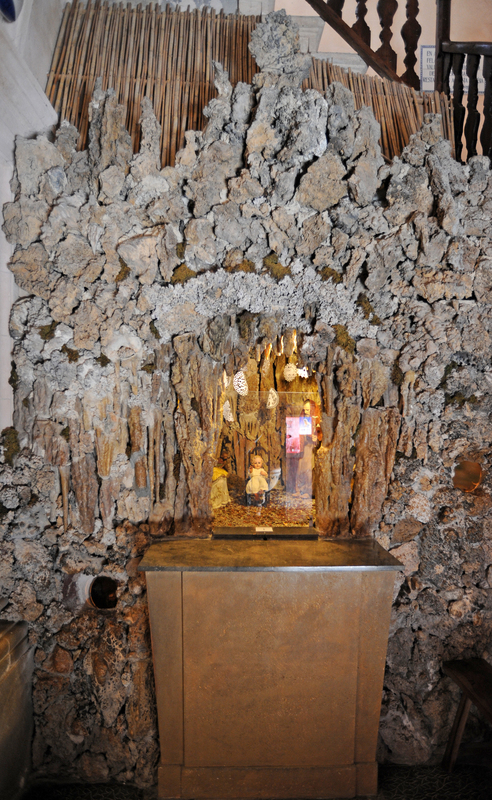 On the pilgrimage route that goes to the sanctuary, is a small chapel containing a sculpture representing the popular tradition of the discovery by a shepherd of the image of the Mare de Déu de Sant Salvador. 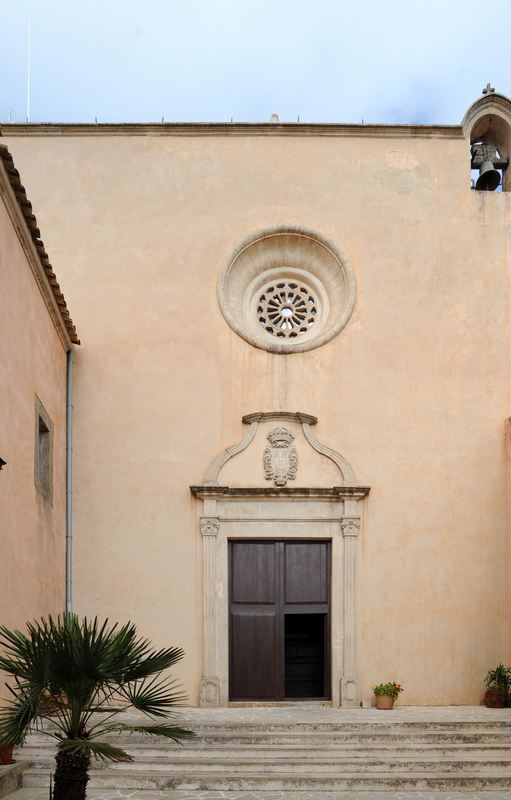 In the lobby of the sanctuary, one can see a "Last Supper" carved from the seventeenth century, which is a copy of the "Last Supper" of the portal Belvedere (Porta del Mirador) of the Cathedral of Palma. In a more secular kind, are exposed six jerseys cycling world champion Guillermo Timoner Obrador, a native track cyclist Felanitx. The first chapel was built in 1348 atop the hill that is now called the Puig de Sant Salvador, Peter III, King of Aragon and Prince of Catalonia, was allodial land lord including the Puig de Sant Salvador, Pere III de Catalonia-Aragó authorized the town of Felanitx to build on top of Puig, a chapel dedicated to the cult of the Passion of the Image of the Savior (Passio Imaginis Salvatoris) to place the population of the city under the protection the Savior after a terrible epidemic of plague that ravaged Europe and is 900 deaths - half the population - in Felanitx in 1348. The Chapel of St. Saviour was completed the following year. 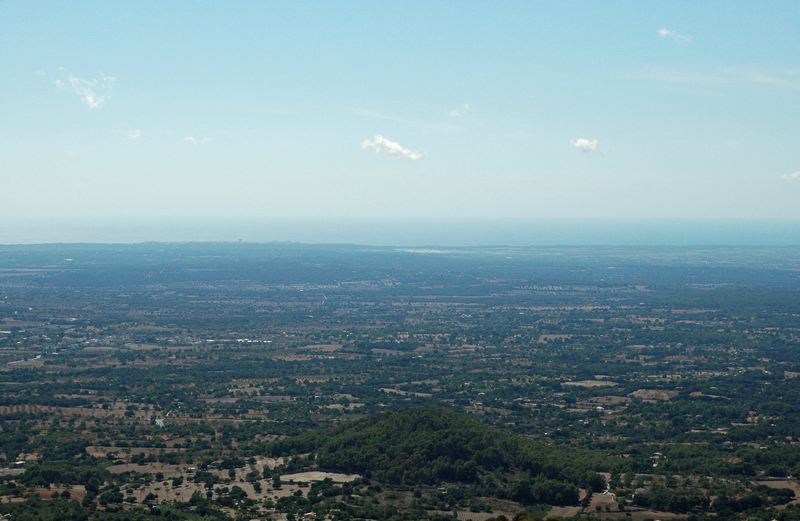 The puig is therefore named Puig de Sant Salvador. 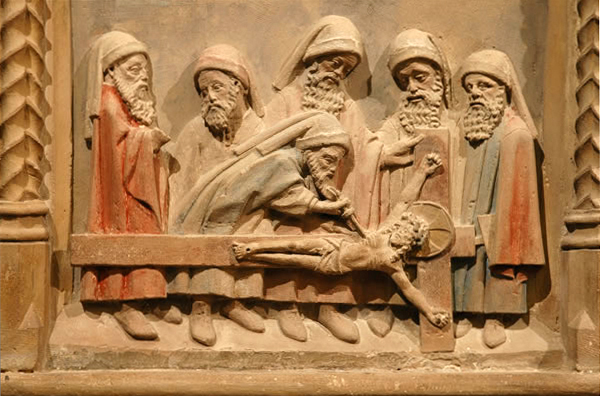 In the fifteenth century, an altar of stone was placed behind the altar of the chapel of origin, this altarpiece depicts the Passion of the Christ Image of Beirut (Passió de la Imatge del Crist de Berit / Pasión de la Imagen de Cristo in Berit). This altarpiece is now in a chapel to the right of the current church. 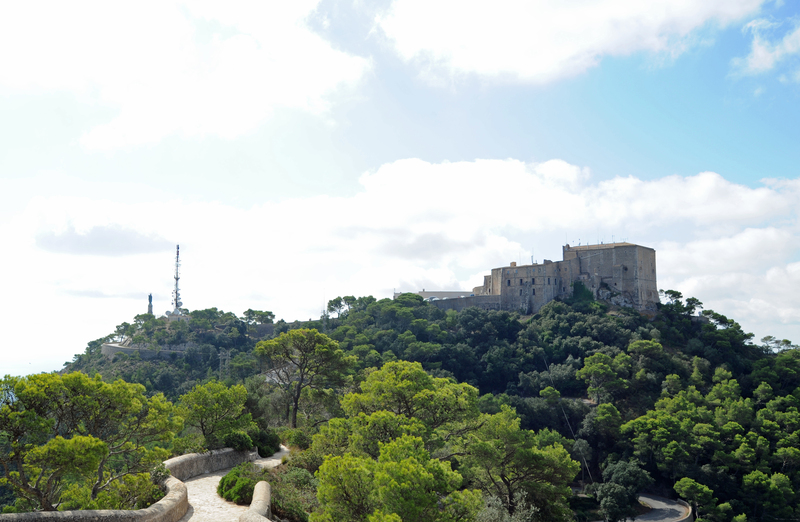 From the mid-sixteenth century and the seventeenth century, there was at the top of Puig de Sant Salvador, a church which is not known if it was a new church or an enlargement of the chapel of the fourteenth century. 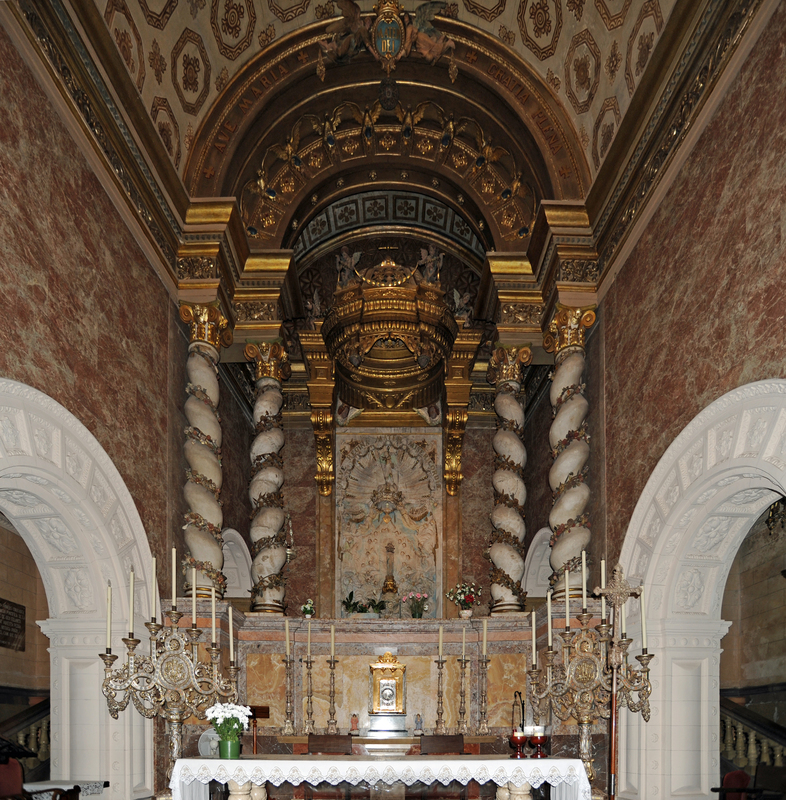 This church of the sixteenth and seventeenth centuries had two chapels: the main was devoted to the Passion of the Christ Image (Passio Imaginis Christi), the second chapel was dedicated to the Virgin Mary (Mare de Déu), represented by a sculpture stone of the fifteenth century, who knew a great devotion. 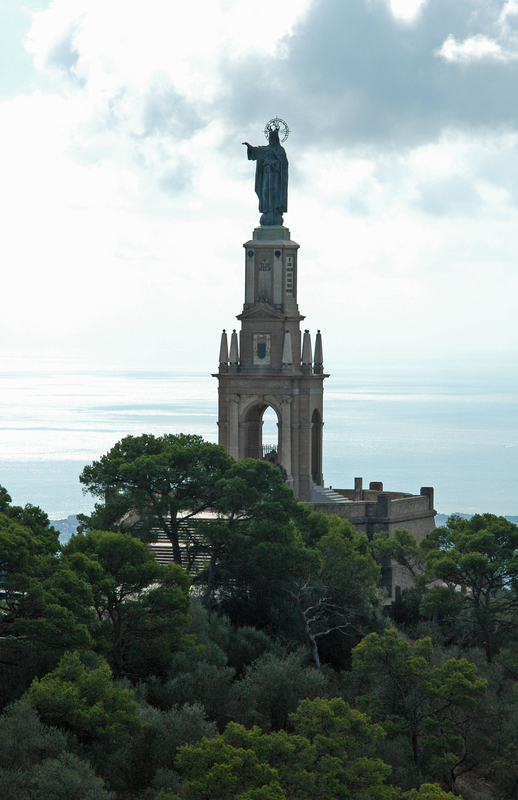 The Mount of Sant Salvador was known as Our Lady of Mount St. Saviour (Puig de la Mare de Déu de Sant Salvador). Cope with the influx of pilgrims, who went on the hill on holidays, the existing church is not enough. 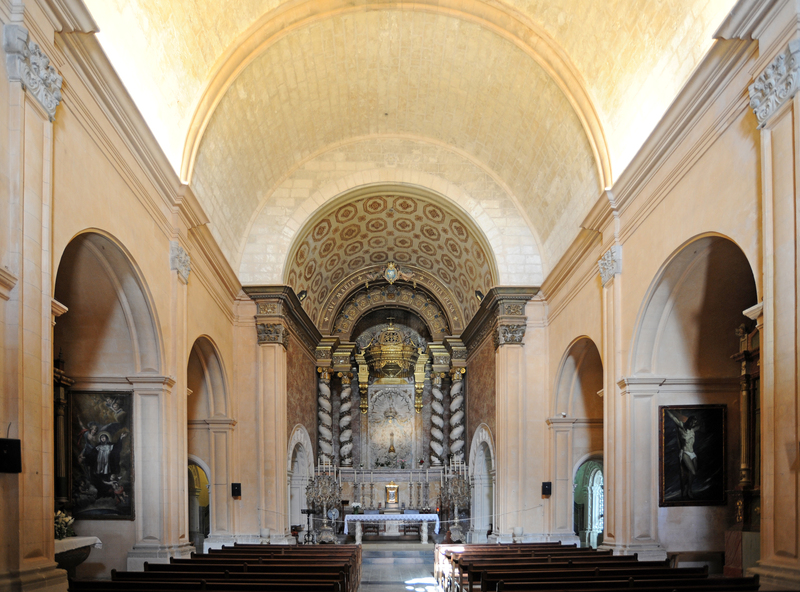 In 1707 began the construction of a new Church of Our Lady of St. Saviour (Mare de Déu de Sant Salvador), which is the present church. In 1715, the church not yet fully completed, was consecrated. On 23 and 24 August of the following year, 1716, was celebrated with solemnity transfer the statue of the Virgin from the side chapel to the new altarpiece of the main altar located in the apse of the new church. This Baroque altarpiece from the early eighteenth century, dated 1713, is the work of a sculptor from Valencia, Pere Joan Codonyer. The cult of the Passion of the Christ Image of having fallen into disuse, the altarpiece of the Passion was transferred to the altar in a side chapel. 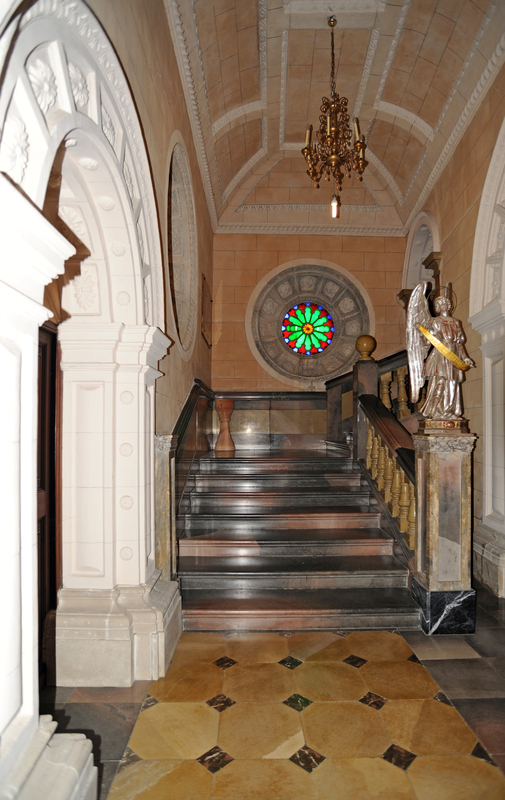 During the years 1930-1942 the sanctuary underwent major restoration and a new altar, carved in alabaster, was built. The image of the Mare de Déu de Sant Salvador had the honor of papal coronation in 1934, solemnly held in the courtyard of the parish church of Felanitx. 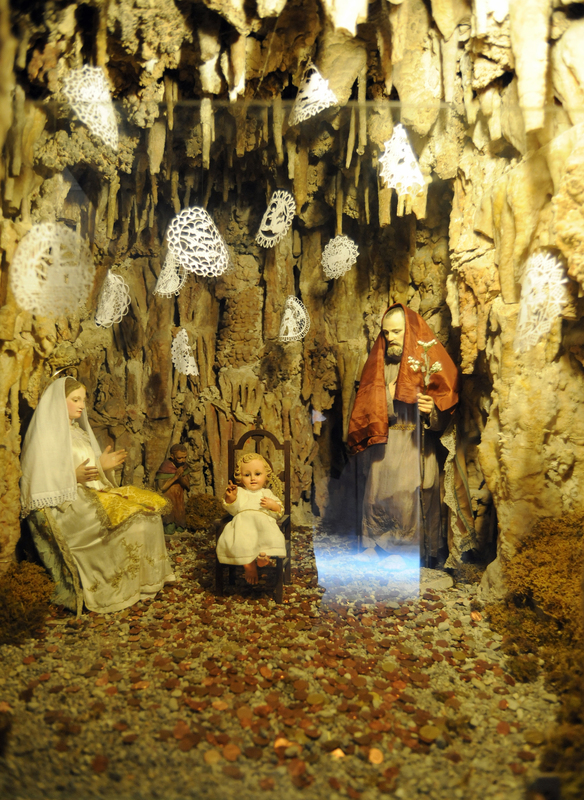 A manger diorama is located near the entrance of the church. The Chapel of the Passion of the effigy of Christ on the right of the Notre-Dame de Sant Salvador. This chapel contains an altar whose altarpiece depicts the Passion of the Christ Image (Passió de la Imatge del Crist / Pasión de la Imagen de Cristo). This altarpiece adorned the altar of the original chapel, he was transferred to the side chapel where the cult of the Passion of Christ effigy dwindled. This cult of the Passion of the effigy of Christ (Passio Imaginis Christi) appeared in the churches of the West from the twelfth and thirteenth centuries. This devotion was based on a legend, reported by the Second Council of Nicaea (787), on an icon of the city of Beirut (Berit), while in Syria. According to this legend, the icon of the Savior, having been subjected to ridicule and cruelty of the Jews, that mimicked those of the Passion of Christ, shed blood and sweat, and made many miracles. This event took place in the year 765 in Beirut. "Beryti in Syria, commemoratio Imaginis Salvatoris, quae a iudaeis crucifixa, tam copiosum emisit sanguinem, ut orientales et occidentales ecclesiae ex eo ubertim acceperint". "Beirut Syria commemoration of the Image of Christ, the Jews crucified, who shed so much blood that the Churches of the East and the West received in abundance". 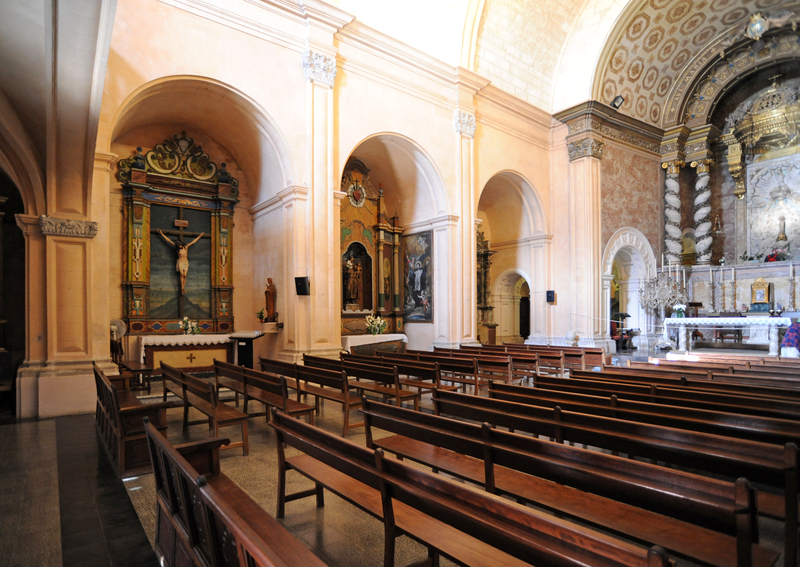 This cult spread to all the cathedrals of the Principality of Catalonia, where he had his own altars, and in some church and chapels dedicated to the Saviour late as the Chapel of Sant Salvador de Felanitx or that of Sant Salvador de Artà. 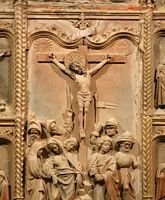 The altarpiece of the Passion of the effigy of the Saviour is a sculptor Majorcan Huguet Barxa (1428-1462), the mid-fifteenth century, it is the only Gothic altarpiece in Mallorca. 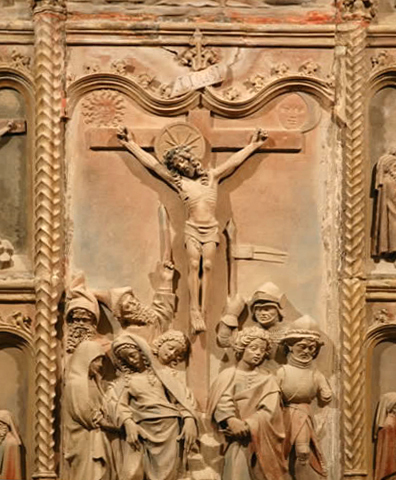 The altarpiece in polychrome stone - carved in bas-relief in stone of Santanyí - represents a group of Jews which pierces the side of a crucifix. You can still see traces of polychromy on the altar. 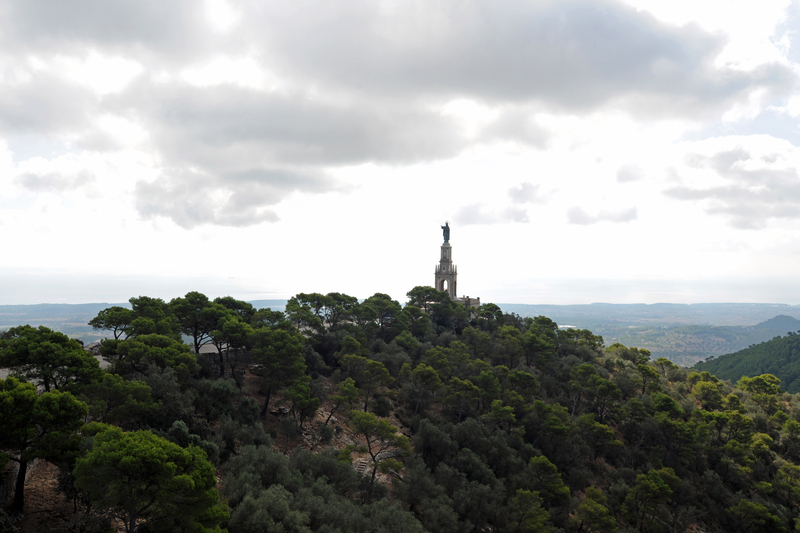 At the top of Puig de Sant Salvador, a few dozen meters south-east of the sanctuary stands the monument to Christ the King (Jesus Christus Rex). This huge monument, 37 meters high, has a statue of Christ the King. The copper statue, 7 meters high, behind the right hand in blessing. 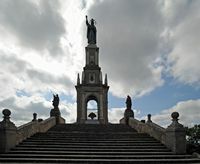 The first stone of the monument was laid and blessed May 20, 1928, the monument was inaugurated in 1934 at the papal coronation of the image of Our Lady of Sant Salvador. 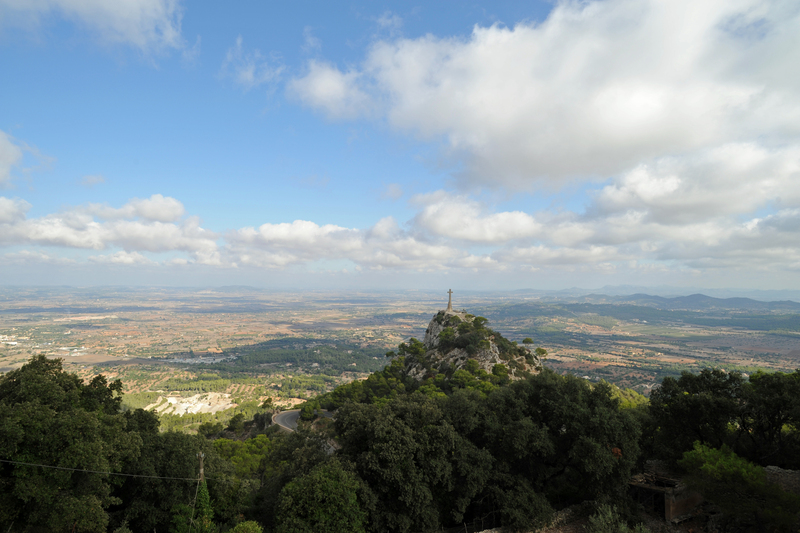 The Peak (Picot) is a secondary peak (477 m) of the Puig de Sant Salvador, located north of the summit of the puig where the sanctuary and the access road to the shrine passes between the two peaks. Picot is reached by a path that is on the left just before reaching the sanctuary. In the late nineteenth and early twentieth centuries, there were, on top of the Picot, a wooden cross, from 1928 to 1951 there was a cross of iron and copper. 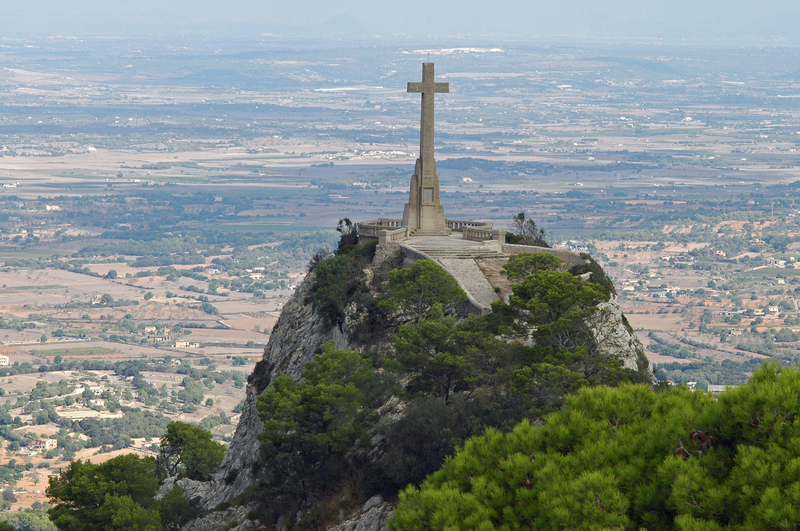 In 1957 was built a monumental cross artificial stone, 14 meters in height, Creu del Picot. The annual festivities of Sant Salvador de Felanitx take place - with a large participation of the population - the nearest Sunday to 8 September, the anniversary of the papal coronation of the Mare de Déu de Sant Salvador in 1934. The first Sunday after Easter, the Sunday of the Angel (Diumenge del Angel / Domingo del Angel) also gives rise to the festivities. Mass is still celebrated in the church on holidays. The inn was built largely in the eighteenth century. It has a restaurant and a dozen singles, renovated in 2002, pilgrims and travelers.